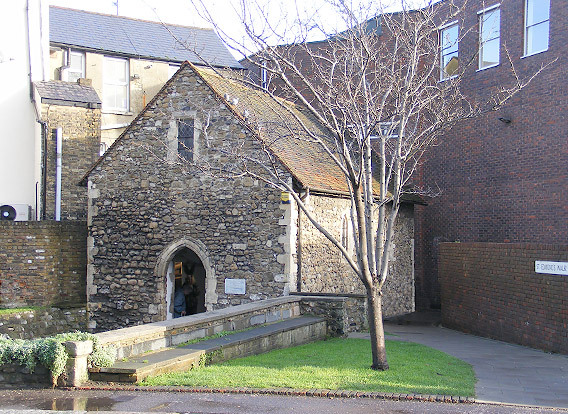 Near to the Maison Dieu, in Dover, the monks of the Priory of St Martin established a cemetery for the poor with its own small chapel. Consecrated on 30 March 1253 by Bishop Richard of Chichester, it was dedicated to St Edmund. 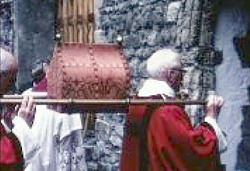 Reconsecration of the Chapel in 1968. It could be said that this little chapel is perhaps miraculous. Probably built very early in 1253 or late 1252, it physically survived the Reformation and Dissolution of the Monasteries ordered by Henry VIII. Its sanctity having been lost for more than 400 years, it is recorded that during that passage of time it fell into use as a store and smithy. Remarkably, it then failed destruction when very close buildings were destroyed by enemy action in WWII, and finally it escaped demolition in the 1960’s by a council, which did not realise its significance, eager on widening Dover’s town high street. Today, by the efforts of many, the chapel stands complete and in full public view, and is testimony to the few individuals who over a number of decades, strove against many odds to identify and restore it to regular ecclesiastical use. The restoration was substantially achieved by the determination of Rev Father Terence E Tanner the Parish Priest of St Paul’s RC church in the town, together with the financial help of a number of interested parties. In recognition of Father Tanner’s endeavours, a memorial plaque is mounted in the chapel. His ashes are also interred close to the altar. Since the completion of its restoration, and its re-consecration in 1968, the building has been totally ‘disconnected’ from other abutting buildings which have since been demolished. It has therefore been possible to include among the photographs on this website, one of the rear of the chapel; albeit a view from the narrow passageway (now named St Edmund’s Walk) leading from the High Street. Throughout the restoration work only mediaeval material was used. The flagstones came from Faversham Abbey in Kent (1152-1160). The main part of the altar was built from recovered stone from Bell Harry tower of Canterbury Cathedral, (1475-1507). The ‘Mensa’ Stone (the top stone) of the altar is pre-reformation, and was found in a farmyard adjoining the church of St. Clement in Old Romney, Kent. The two central tie-beams came from a barn on the Barham Downs at Elden, Kent. The east beam is original, however there is no evidence that a west beam was ever fitted by the original builders of the chapel. The roof is a remarkably fine example of 13th Century construction with a number of its original tenon joint securing pegs still in place. The floor area in front of the altar is constructed of flint cobblestones that have lain undisturbed since about the 14th Century. The Crucifix in the style of the 13th century which is mounted on the east wall, is a contemporary carving by the late Robert Forsyth of Dover, who also made a beautiful carving of St Richard which is displayed in the Stone Hall of the Maison Dieu. The two bishop figures mounted on the front face of the altar are the images of St. Edmund (left) and St. Richard (right). A small relic of St. Edmund in the south wall niche was donated by the Abbey of Pontigny, France, where St. Edmund’s shrine still stands today. The restoration was carried out between 1966 and 1968 by local craftsmen, under the detailed direction of historic buildings architect and consultant, Anthony Swaine FSA, FRIBA of Canterbury.